Between New Zealand and Tonga is a seafloor studded with volcanoes. 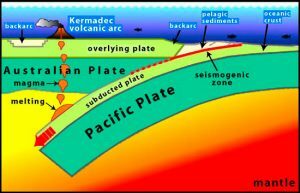 This long chain of hidden giants is known as the Kermadec-Tonga Arc, and it represents one of the most hydrothermally-active regions on the planet. 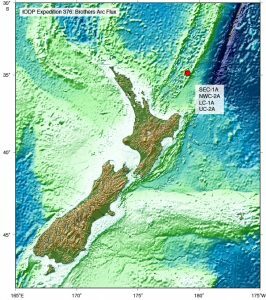 For scientists, the jewel in the crown is Brothers volcano, located about 400km north-east of the North Island of New Zealand and whose summit lies 1.2km beneath the waves. 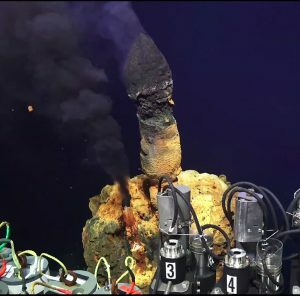 This very special volcano offers a remarkable window into the hydrothermal systems that occur along submarine volcanic arcs. As these systems were the focus of Expedition 376, Brothers volcano was our sole destination. Volcanic arcs form where a tectonic plate subducts beneath another (Fig 1). At depth, the subducting plate partially melts and/or releases water enabling the portion of mantle beneath the overriding plate to also melt. Magma rises toward the surface and erupts, resulting in arcuate zones of volcanism along the boundary between the two plates. The magmas involved in arc volcanoes are very rich in volatiles. 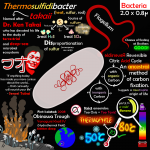 Volatiles are compounds that can boil at a relatively low temperature. 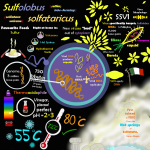 Major volatiles include water, carbon dioxide and sulfur. These are released by the magma and can be transported by hydrothermal fluids circulating through the seafloor. The higher concentrations of volatiles and gases in the fluids is one of the things that makes the hydrothermal systems of submarine arcs different from those found in other tectonic settings, such as mid-ocean ridges. (Fig. 2) ROV Jason encounters a Black Smoker Chimney at Brothers. Courtesy of Dr. Anna Louise Reysenbach, Portland State University, Funder, NSF; ROV Jason, Woods Hole Oceanographic Institution. 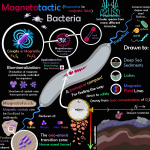 Hydrothermal systems form when water—in this case seawater—interacts with the heat from underlying magma. Along volcanic arcs, seawater percolates deep down into cracks and faults near the summit of the volcanoes. As it flows through the rock, chemical reactions occur that result in an exchange of elements between the rock and the seawater. The fluids also heat up as they come in contact with rock heated by magma, or even come in close proximity to the magma itself. Several kilometers deep, metals are leached from the rock and any volatiles that are released by the magma are taken up by the fluid. As the fluid heats up, it becomes more buoyant and begins to rise up, transporting metals and volatiles towards the seafloor. On the way, numerous reactions and physical changes to the hydrothermal fluid take place. 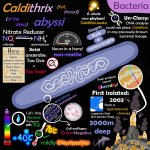 At the seafloor itself, the hot fluids discharge and mix with the surrounding cold seawater. 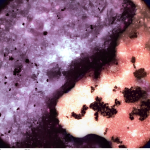 Solid particles, including metal-rich oxide and sulfide minerals, precipitate out of this mixed solution forming billowing smoke-like plumes. At the actual point of discharge, these particles build up, and can form large structures known as ‘chimneys’ up to 20m high (Fig. 2). Depending on the temperature and composition of the exiting fluid, chimneys of different structure and mineral composition can form. 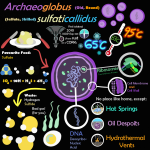 There is evidence to suggest that the buildup of metal-rich mineral deposits on the seafloor through hydrothermal circulation is responsible for the large deposits of minerals containing metals such as copper, gold and zinc that can be found in some ancient geological records on land. Brothers volcano is particularly remarkable in that it hosts two distinct types of hydrothermal activity. Scientists already know a fair amount about these systems from previous expeditions involving deep-diving submersibles and remotely operated vehicles. 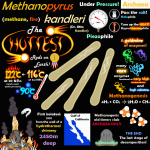 However, comparatively little is known about the specific processes that take place deep beneath the seafloor, including how metals are transported inside the volcano. 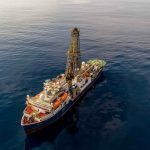 Scientists aboard IODP Expedition 376 collected core and borehole data from various sites about the volcano with the aim of clarifying the key underlying processes that distinguish hydrothermal systems of submarine arc volcanoes from those of spreading environments (e.g mid-ocean ridges). These sites are variably affected by volatiles, enabling them to directly assess the impact volatiles have on these systems at depth. These samples and data will also be used to determine the make-up of fluids at depth, the chemical reactions that take place on the way to the seafloor, and how various metals are transported and deposited within the seafloor, and to assess the consequences of toxic and acidic environments for the micro-organisms that live in and around the hydrothermal systems. This expedition was the first time the JOIDES Resolution (or any research vessel) drilled into an active underwater volcano! "MAD" Science on Expedition 376! E ngā iwi o te ao, tēnā koutou katoa. I work as a Tour Guide and an Educator between the Museum of New Zealand Te Papa Tongarewa and Te Māra ā Tāne ZEALANDIA EcoSanctuary in Wellington, New Zealand. Much of my work involves telling stories, of land, of life, of people and beyond. To me, science represents a source for storytelling on the grandest of scales: a chronicle of the humble origins of life, the mass-movement of mountains, the birth and death of the stars. Key to it all are the people who dedicate their lives to broadening our perspective, pushing the boundaries of what we know. 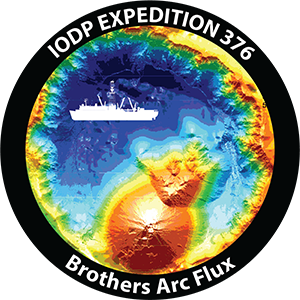 I am humbled to be presented this amazing opportunity to tell such stories as I sail on IODP Expedition 376 as Aotearoa New Zealand's Education & Outreach Officer.